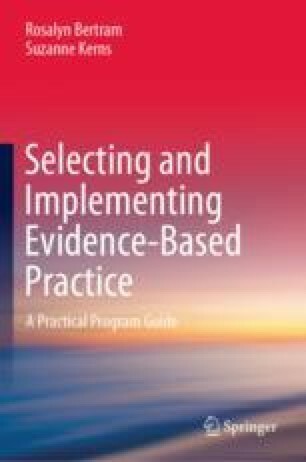 Despite increasing emphasis for more than two decades on utilizing a process of evidence-based practice or evidence-supported treatment models, a gap remains between what we know works and what we actually do. Curriculum development and instruction in professional degree programs are significant contributing factors to this research-to-practice gap. Curricula are developed by faculty and reviewed and approved (or not) by faculty committees. Faculty concerns or misconceptions, their knowledge and experience, can support, slow, or impede the integration of evidence-based practice and implementation science into academic workforce preparation. Faculty opinions and beliefs, what they know or don’t know, what they can or cannot do, shape academic and field curricula. Logically, in addition to professional values and ethics, advances in science, funding source expectations and the related needs of service systems and organizations should inform the focus and content of curricula. Insel, T. (2015, July 14). Post by former NIMH director Thomas Insel: Quality counts [Blog post]. Retrieved from https://www.nimh.nih.gov/about/directors/thomas-insel/blog/2015/quality-counts.shtml.